Just today there was an article in the paper about the abuse and insults many returning troops face when come back from Iraq and Afghanistan and enroll in college. Here is a sample from that article: “Why should we pay for these guys to go to college?” Hakim said he recalls a female student asking during a discussion on the nation’s responsibility to service members returning from war. “Everybody who goes into the military is stupid – that’s why they joined the military instead of going to college.” Wow !! Those who think that way need to pick up Sean Parnell’s memoir of his year spent in mortal combat with the Taliban in Afghanistan. 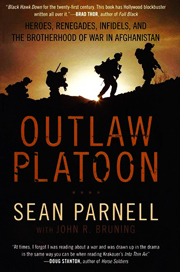 Outlaw Platoon tells the very real story of 24 year-old Captain Sean Parnell and the 40 brave men of the Army’s 10th Mountain Brigade. They fought almost daily against a well-trained, hell bent for killing group of fanatical insurgents. Several of the men would never make it home and four out of five were wounded during their 16 months in combat. Before, during and after the battles we come to know the men of Parnell’s team. We see them as the individuals they are, each with their own unique set of hopes and dreams. They come from all walks of life and what bands them together is their total love for and loyalty to each other. It’s this total lack of self and devotion to one another that enables them to survive. The count on one another to perform in the midst of the chaos of war and they do this so well that the enemy comes to fear this group of warriors known as the Outlaw Platoon. Intense summer heat and bone-chilling winter cold were constant companions and Parnell as an author does an excellent job in making the read feel the horrific climate in which the battle take place. Outlaw Platoon is a special book. The details are true and they force us out of our comfort zone here at home and help us to understand the pain and suffering, the agonizing and often paralyzing fear that our troops endure. All of them are there for a reason but none of those reasons are “stupid”. Very few books have a higher ratio of five star reviews than does Sean Parnell’s brilliant account of our military heroes in this far away land. Reading their story gives me a new appreciation of the sacrifices they make on a daily basis. I gave Outlaw Platoon ****1/2 stars.